Looking to hire 10,000 Maniacs for a private party, fundraiser, gala, public concert, wedding, college, fair or festival worldwide? BookingEntertainment.com makes it easy to get available dates, pricing and fees for booking 10,000 Maniacs. Fill out an entertainment request form and a 10,000 Maniacs booking agent who can assist you in booking 10,000 Maniacs will get back to you to discuss booking 10,000 Maniacs for your event. 10,000 Maniacs (named after the low-budget horror movie 2,000 Maniacs) was formed in Jamestown, NY, in 1981 by singer Natalie Merchant and guitarist John Lombardo. Other members of the sextet were Robert Buck (guitar), Steven Gustafson (bass), Dennis Drew (keyboards), and Jerry Augustyniak (drums). The group gigged extensively and recorded independently before signing with Elektra and making The Wishing Chair in 1985. Co-founder Lombardo left the band in 1986, and they continued as a quintet, releasing their second album, In My Tribe, in 1987. This album broke into the charts, where it stayed 77 weeks, peaking at number 37. Blind Man's Zoo, the 1989 follow-up, hit number 13 and went gold. The booking agents at Booking Entertainment have helped clients book big name entertainers like 10,000 Maniacs for private parties, corporate events and public shows around the world for over 20 years. Our agents will be happy to assist you with any of your big name entertainment buying needs. All you need to do is fill out an entertainment request form or call our office at (212) 645-0555, and one of our entertainment agents will help you get pricing information and availabilities for 10,000 Maniacs or any other A-list entertainer for your next event. How Much Does It Cost To Book 10,000 Maniacs? Looking for 10,000 Maniacs booking fee and pricing? When you are booking an act like 10,000 Maniacs, many factors determine the final price, including the artist's touring schedule and other shows they may have in your area. Fill out an entertainment request form or call our offices at (212) 645-0555 and one of our booking agents will get you a pricing fee and availability for your date and assist you in booking 10,000 Maniacs or a different big name act for your next event. How Do I Hire 10,000 Maniacs For A Private Party? The booking agents at Booking Entertainment have been booking and producing big name acts for private parties worldwide for almost 20 years. Whether you are looking to book 10,000 Maniacs for a birthday party, Bar Mitzvah, Bat Mitzvah, wedding or anniversary party, your assigned Booking Entertainment agent will be happy to help you to book 10,000 Maniacs and take care of everything to make sure the show is executed flawlessly. Fill out an entertainment request form or call our office at (212) 645-0555 and one of our booking agents will assist you in hiring 10,000 Maniacs for a private event. How Do I Book 10,000 Maniacs For A Fundraiser or Gala? We have a number of clients that are looking to book 10,000 Maniacs or other big name acts for fundraisers and galas. Your assigned Booking Entertainment agent will be happy to help you to book 10,000 Maniacs and take care of everything to make sure the show is executed flawlessly. Fill out an entertainment request form or call our office at (212) 645-0555 and one of our agents will assist you to book 10,000 Maniacs or another celebrity talent for your next fundraising or gala event. How Do I Book 10,000 Maniacs To Perform At My Wedding? You might ask yourself, "Can I get 10,000 Maniacs to sing at my wedding?" We have a number of clients that are looking to book 10,000 Maniacs or other big name acts for weddings and wedding ceremonies. Your assigned BookingEntertainment.com agent will be happy to assist you in hiring 10,000 Maniacs to perform and make sure your wedding entertainment is executed flawlessly. Fill out an entertainment request form or call our office at (212) 645-0555 and one of our agents will get you a pricing fee and availability for your date. 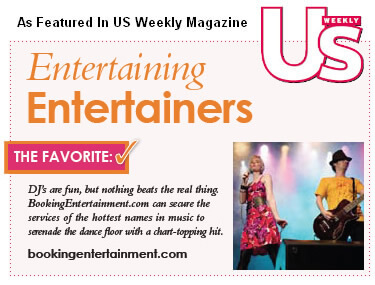 Booking Entertainment will assist you to book 10,000 Maniacs or another celebrity talent for your wedding. Who Is The Agent For 10,000 Maniacs? The agents at Booking Entertainment have booked big name acts like 10,000 Maniacs for clients around the world for almost 20 years. Although we are not an exclusive agency, we will assist you in submitting your offer to the appropriate company for consideration. When the offer comes from us on your behalf, you benefit from our reputation and relationships. Fill out an entertainment request form or call our office at (212) 645-0555 and one of our agents will assist you to book 10,000 Maniacs for your next public, private or corporate event. How Do I Book 10,000 Maniacs For A Corporate Event? Booking big name entertainment corporate events is a great way to thank your employees and clients, as well as a fantastic way to promote your company's image. The booking agents at Booking Entertainment have been helping clients book big name acts like 10,000 Maniacs for corporate events worldwide for almost 20 years. Whether you are looking to book 10,000 Maniacs at a trade show or an employee appreciation event, your assigned Booking Entertainment agent will be happy to help you to book 10,000 Maniacs and help to make sure that every aspect of the show is taken care of to make sure the show is executed flawlessly. Fill out an entertainment request form or call our office at (212) 645-0555 and one of our entertainment agents will assist you to get pricing and availability to have 10,000 Maniacs or another headline talent perform at your next corporate event.